I wanna fly like KRRISH! So KRRISH is playing at the Georgetown in town (has been for a week now and was actually premiered the day of its release at the local IMAX where Superman Returns: An IMAX 3D Experience is supposed to be playing) and I really want to see it (even if I haven’t seen Koi…Mil Gaya yet). Ironically, since we’ve all heard the urban legends (or might have experienced personally) of children putting on towels and jumping off furniture or rooftops so they (or we as the case may be) can “fly like Superman,” it seems that KRRISH can have the same effect. Ugh. I had blogged about Jirapat Tasanasomboon at the old Mae Mai blog earlier last year. He has since completed a few other paintings. Though this one above is an older painting I thought that this it was interesting and needed no commentary. Jirapat Tasanasomboon was born in 1971 in Samut Prakarn and completed his Master Degree from Silapakorn University in 1999. He applies a pop-art style to his subjects who often feature well known (super)heroes from cartoons such as Batman, Superman and Spiderman as well as science fiction movies. 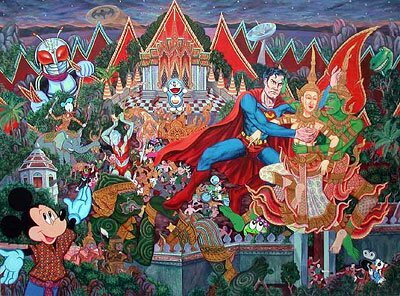 His heroes are depicted in a distinctive Thai setting and are often seen interacting with traditional Thai heroes and mythical figures, most of whom are characters in the Ramakien (Ramayana). It might be seen as an indicator of the complex relationship between Thailand and one of its closest allies. Sometimes a loving relationship, but at other times struggling. Jirapat has participated in several art shows in Thailand and also in Korea (2003). As some of you may already know, I am a legal permanent resident of the United States but not a citizen. Thailand is still a Kingdom, if only a constitutional monarchy. All the monarchs of the Chakri Dynasty of Thailand are named after Rama including His Majesty King Bhumibol Adulyadej (King Rama IX). There’s more to Rama than Grant Morrison. The Oral Tradition and the Many “Ramayanas”, by Philip Lutgendorf. Many Ramayanas: The Diversity of a Narrative Tradition in South Asia, ed. by Paula Richman.